One of the first things I knew I wanted to change when we moved into our house was the brass hardware: knobs, hinges and light fixtures. I pictured that happening immediately, but the reality of how much time it takes to renovate kicked in, and I am just now getting to the hardware! I wanted to share with you a quick, cheap and easy way to get the finish you want on your hardware without having to buy all new pieces. The stuff is expensive, so buy a can of spray paint instead and invest a little time! This one change makes a huge difference in the look of your decor. I finally got addressing the hardware as we finished up the laundry room you have heard me going on about around here lately. It was so perfect… new floor, new built-in mudroom bench, striped walls and laundry room printables. Then there were the shiny brass hinges, locks and knobs. I couldn’t take it. The solution was a $7 can of spray paint and a little time. I just removed the doors and took off the hinges and knobs, cleaned them with soap and water, dried them completely and sprayed them with Rust-Oleum Metallic Paint & Primer in One – Oil Rubbed Bronze. I let them dry overnight just to be safe, and put everything back the way it was, new and improved! I gave you a sneak peek at the mudroom bench. You will be getting a detailed how to quite soon! Hello! I’m Steph and I blog at The Silly Pearl. 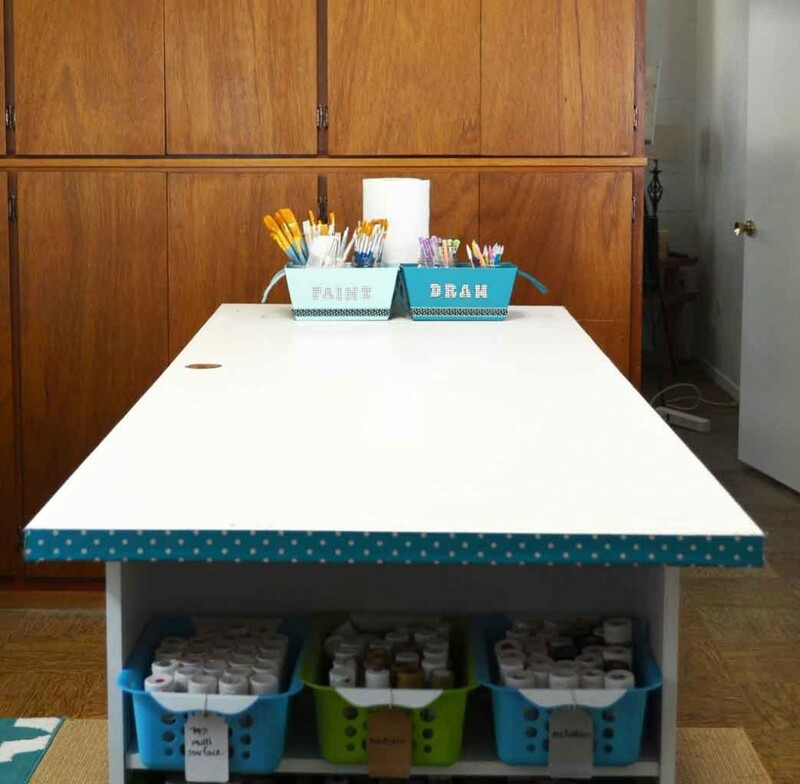 I’m mom to 7 year old twin girls and I live in the San Francisco Bay Area.I love to repurpose containers into storage for my craft room. 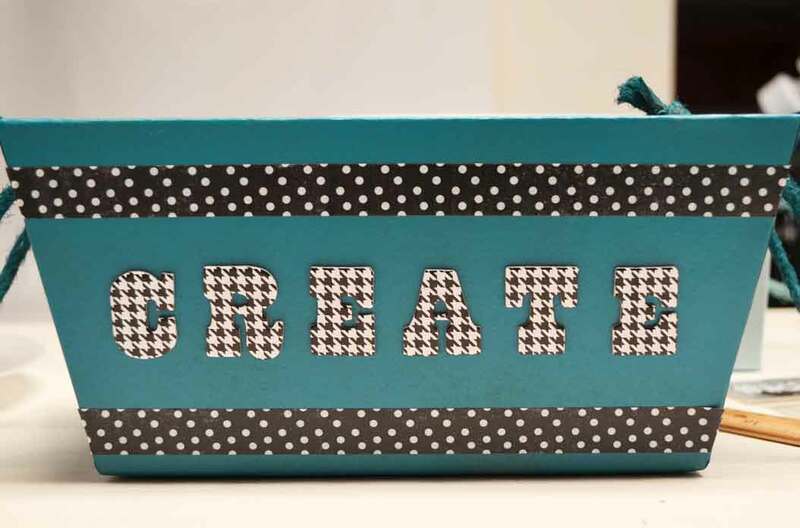 So I’m excited to show you what I made today here on Saved By Love Creations: I took a plastic toy car storage box (don’t worry, it’s not vintage!) and created a storage box for my collection of vintage trims that I’m always collecting from the thrift store. 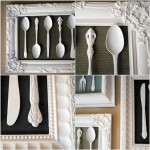 Thanks so much Johnnie for having me on your blog today to share my tutorial! My girls do have a collection of cars themselves, but most are larger and wouldn’t fit into the compartments of the box. So I thought I could use it for myself in the craft room, to house all the little lengths of rick rack, seam binding, lace, and bias tape currently tangled in a box. First step is to remove the label on the front and spray paint the entire box, inside and out. 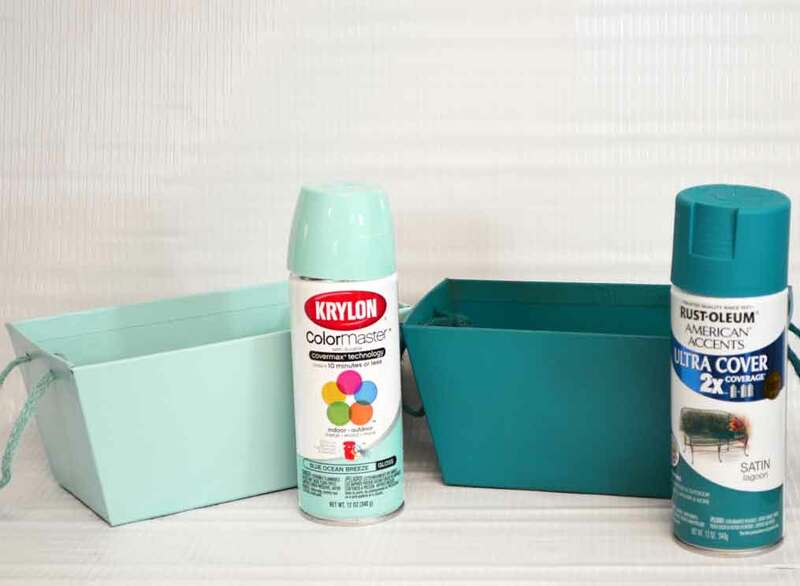 Choose a spray paint that bonds to plastic. Use a primer as well. Do several thin coats, allowing time to dry in between. Be sure to follow the drying time recommendations on the spray cans, particularly in between the primer and the color. 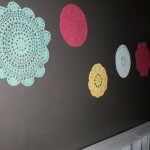 I chose a turquoise color that I have a lot in my craft room. Once the paint is dry and you’ve allowed it to cure, you can start applying the scrapbook paper. An 8×12 inch piece of scrapbook paper fit perfectly on the front (I used my Xyron 9-inch Creative Station to apply adhesive to my scrapbook paper). Then I framed the paper with some red rick rack using my Xyron 1.5-inch sticker maker. Inside the lid, I created a pocket by folding an 8×12 inch piece of paper in half. I applied adhesive to just one of the folded sides and pressed that to the bottom half of the lid so that the other half of the paper unfolds out towards the bottom. Then I applied adhesive to another 8×12 inch piece of paper and pressed it to the inside of the first piece. Then I applied some double-stick tape to the edges of that unfolded half and pressed down the edges over that 2nd piece of paper. To allow some give for the pocket, I adhered the pocket at a slight angle on both sides. I grabbed some clothespins and wooden spools and wrapped my trims around them. For narrower trims, I used the wood spools, securing the ends with a little bit of washi tape. For wider trims, or for trims where I had a longer length, I used clothespins. 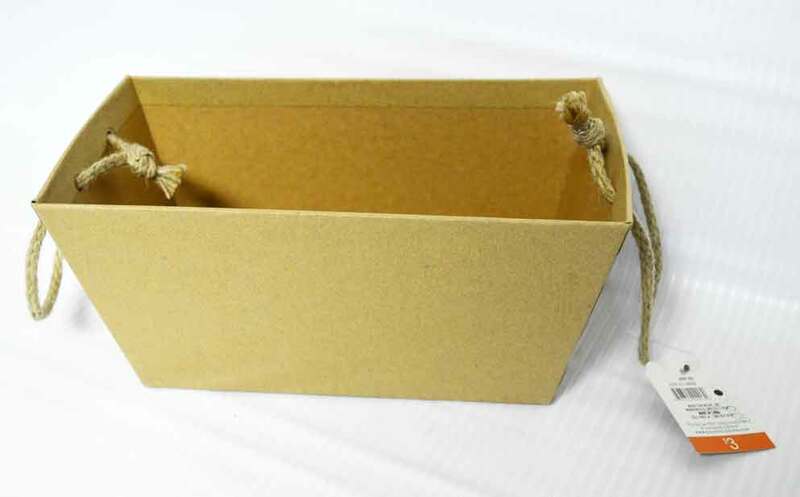 Just make sure the clothespins and wood spools you use aren’t too wide or tall for the compartments. I was able to stack two of these one-inch spools into one compartment. On the outside, I used a piece of cardboard that one of my trims came in, and with some letter stamps and more trims (of course), I created a label and adhered it to the front. All done! Inside, I stored some vintage trims that are still in their packaging. Plus, I added some trim along the edges of the pocket papers. 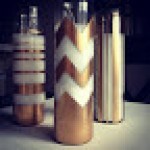 Get the look of expensive mercury glass with a can of spray paint and some Epson salt! This simple project takes a genie lamp shaped liquor bottle to an elegant mercury glass lamp for way less than the purchase price you see in stores. 1. Clean bottle and remove labels; to do this, soak bottles in hot, soapy water and remove labels. Rubbing alcohol in a lint free cloth will remove residual adhesive. My personal favorite technique is Krylon Adhesive Remover. 2. Drill a hole where you want the cord to exit the lamp, in the back near the base. For that technique, see my previous tutorial: How to Make a Lamp From a Glass Bottle. Follow safety precautions! 3. Clean away debris from drilling, dry bottle with a lint free cloth and tape over the hole you just drilled. You will see why! 4. Pour Epson salt into bottle so that to about one inch from the bottom. If your bottle is smaller, you can use less. It is not important to be exact here. 5. In a well ventilated area with protected work surface, spray looking glass paint into mouth of bottle. Make sure to follow instructions on label. You want to shake the can vigourously before using. If your bottle mouth is small in diameter like this genie bottle, you will have paint pooling in one spot and running down the neck. That is fine. 6. Shake the bottle like a snow globe, so that the salt grabs the paint and drags it around. This will create the mercury glass look. 7. Repeat steps 5 and 6 a few more times, allowing each coat to dry for about 5 minutes before applying the next. Stop when are happy with the look. 8. Follow instructions on your lamp kit to assemble. The one used here was super simple to and cost $6. 9. 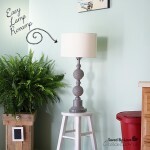 Use a thrift store or new lampshade to fit your décor. ￮ The salt will stick to the wall of the bottle in spots, giving a lovely crystal effect. You can pour as little or as much of the salt out as you want after painting. Use this technique for recycled glass bottle vases, votive holders, wind chimes and more. Keep in mind this only works when the sprayed surface is inside. I am excited to share with you this Dollar Store Craft, a lovely DIY mercury glass candle holder. I made it from the stem of a dollar store martini glass and a dollar store candle holder! Read on to see how I removed the stem and attached it to the holder, and how I created the mercury glass finish with Krylon Looking Glass Spray Paint. Make a score line around the stem of the martini glass at its top where the stem meets the upper part of the martini glass. Apply heat to score line and submerge in cold water to separate the stem at the score line like I showed you in this DIY Wine Bottle Rings tutorial. Sand or grind top of separated stem to give a flat surface for gluing to the bottom of the glass candle holder. Here is the glass I used to glue onto the stem of the martini glass. I used E6000 on to attach two pieces, and placed the glued pieces against the wall for support while drying. Let dry several hours before applying the mercury glass finish in the next steps! Pour Epson salt into the glass so that to about one inch from the bottom. It is not important to be exact here. In a well ventilated area with protected work surface, spray looking glass paint inside of the glass at the rim. Make sure to follow instructions on label. You want to shake the can vigourously before using. Shake the glass a snow globe (holding your hand over the top), so that the salt grabs the paint and drags it around. This will create the mercury glass look. Repeat steps 5 and 6 a few more times, allowing each coat to dry for about 5 minutes before applying the next. Stop when are happy with the look! One of my favorite things about the arrival of spring is finally being able to go outdoors and get busy with spray paint projects! 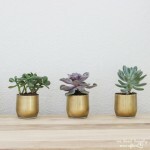 The time is here, and today I am sharing with you my favorite DIY spray paint projects from creatives everywhere. 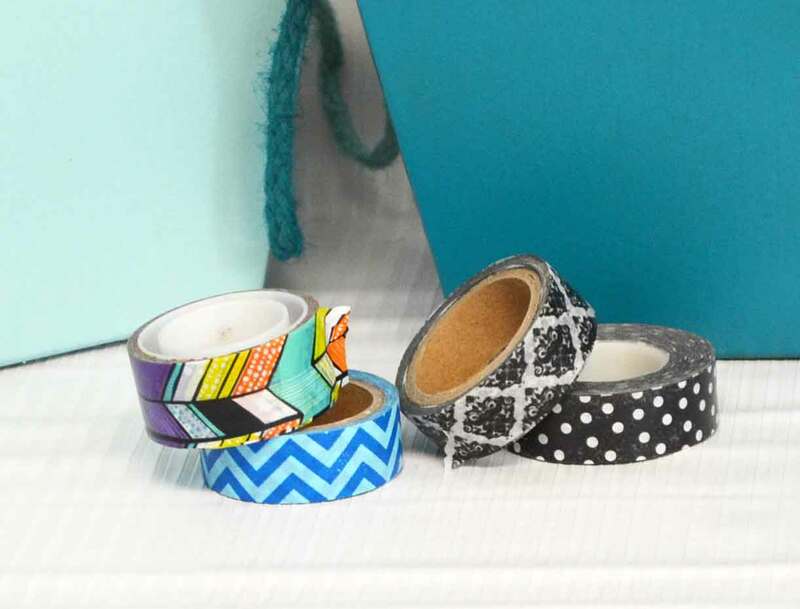 You will find DIY curtains, home decor, wearables and more. 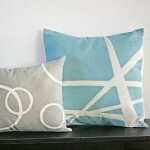 Be ready to be amazed at what you can do with a little spray paint and inspiration. Hello friends! 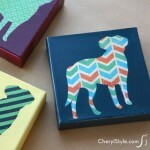 It’s Barbara from Chase the Star, and today I’m happy to share another simple DIY project. Mother’s Day is almost here and Moms love it when we make them gifts, right? Well they did when we were kids, so why not continue the tradition? It’s the perfect size and the back already has a hanger! Step 1: This picture is actually a sticker, so I wet the whole thing and peeled it off with a scraper. After it was dry I went over it with a sanding block. Step 2: Spray it in the color of your choice; I went with gloss black. 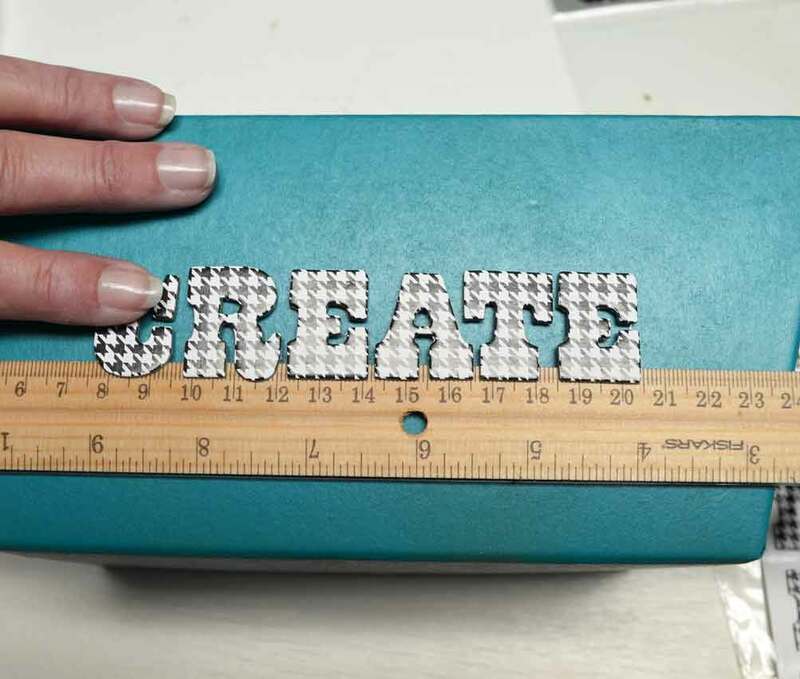 Step 3: Create the verse on the cutting machine, cut it out, and adhere it to the painted wood (for instructions on how to do that click here). Instead of peeling the lettering and painting, I just kept the white vinyl on there. Step 4: Go over the whole piece with the sanding block, carefully! This step is optional but it will reduce some of the gloss (if you used gloss paint) and give it an overall ‘worn’ look. Since the hardware is already on, all you have to do is wrap it up in pretty paper and give it to the Mom in your life! Play around with the fonts on your machine and choose the one that you like the best. I wanted my sign to be simple, so I went with cursive. I think I will make a few more so I can pass them out to friends, back to the thrift store I go! 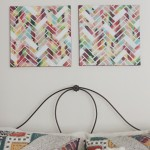 For more creative DIY ideas stop by Chase the Star, and follow me on Facebook, Google+, Pinterest, and Instagram! 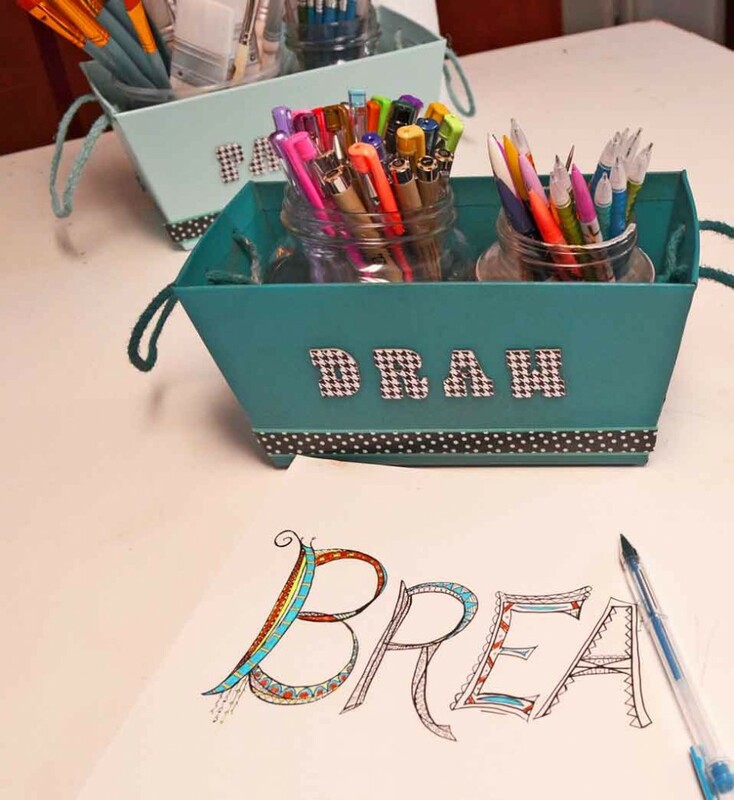 More SBLC Mother’s Day DIY Inspiration! Over 60 Mother’s Day Gifts to make for Less than $10!! Hello there, SBLC readers! This month I have a fun and really quick project for you. I just finished repainting an old desk that took me nearly a week. While I love how it turned out, I was ready to create something cute that only takes a few minutes. I found these cardboard tubs at Target in their Dollar Spot. That place is dangerous! I snagged two, resisting the temptation to buy them all. I thought they’d be the perfect size to corral my paintbrushes, pencils and pens that are always everywhere but where I need them to be when I want them. 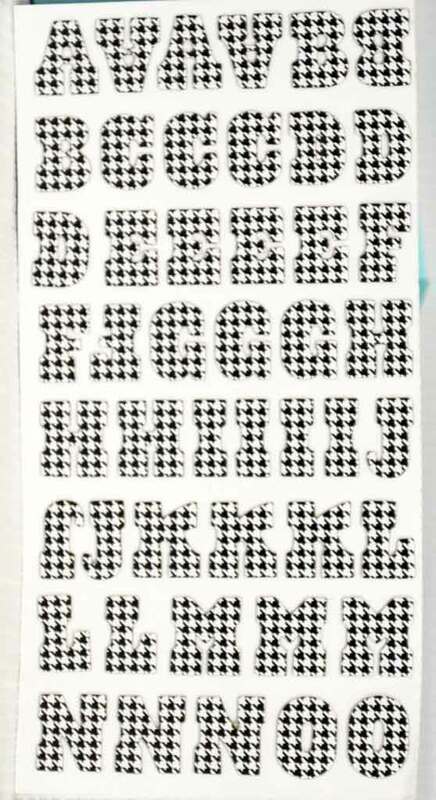 I picked these houndstooth sticky letters up at TJ Maxx a while back, without any idea what I’d use them for. 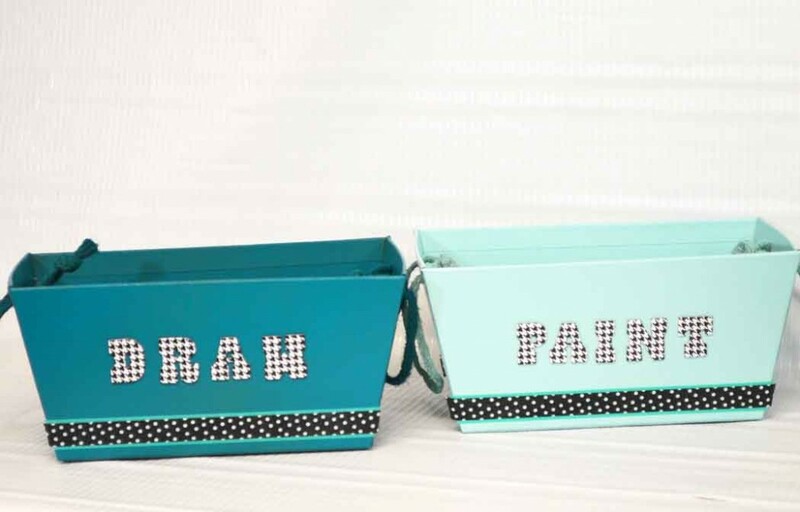 Perfect for labeling some craft tubs. Only one problem though . 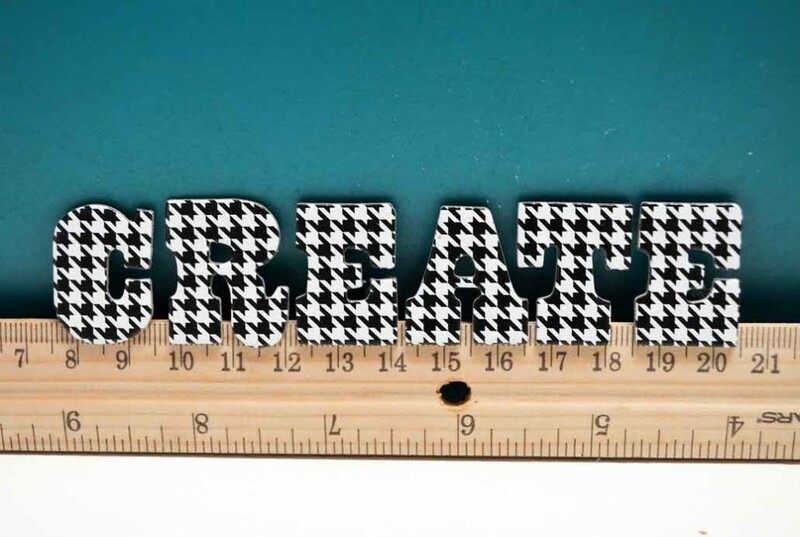 . . with the letters too close together, the houndstooth pattern made it hard to read the word. So I just popped them off, lined them up on the ruler again, farther apart this time, and pressed them back down. Much better. 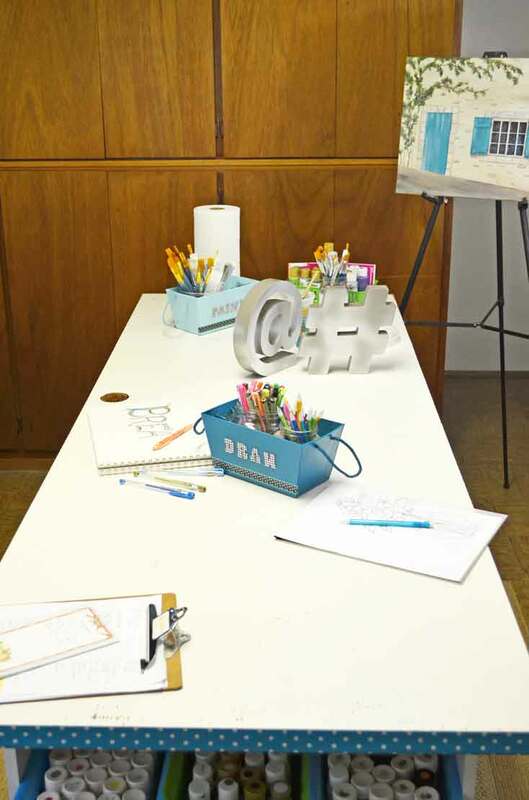 The aqua tub says “Paint” and “Inspire” and holds some of my paintbrushes. The brushes I use the most often. Yes, I have quite a collection having painted for nearly 20 years. I actually have more markers too but I don’t use them as often so they’re tucked away on a shelf. Yeah, I have a huge worktable. It’s actually a door, set on top of two bookshelves, so it measures 30″ wide by 80″ long. 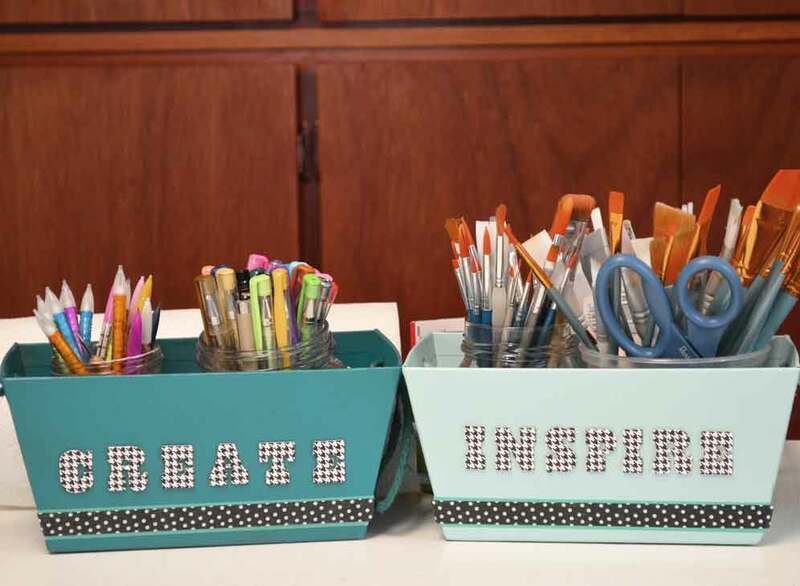 And that’s why I need these craft tubs . . . because my worktable never really looks like this pic above. Of course, if you don’t have little tubs like these, you could decorate a shoebox or any other box with a little spray paint, some stick-on letters and washi tape in a matter of minutes. And choose some words that have a special meaning just for you! It’s a great project when you need to get those creative juices flowing but you don’t have a ton of time. When you do have a little more time, stop by Just Paint It and say hi. I’m getting ready to do some PIY Spring Flowers. (PIY = Paint It Yourself) You can always find me on Facebook, Google+, Pinterest and Instagram too.